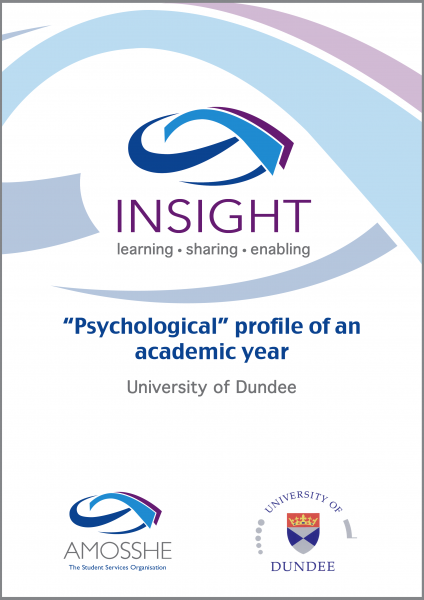 This project, undertaken by the University of Dundee, aims to identify whether there's a pattern in the kinds of issues that students face during the phases of the academic year. Principal investigator: Iliyan Stefanov, Student Support Worker, Student Services. Total award from AMOSSHE: £2,825.45. Experience shows that transition to university life is a stressful time for young people, but the sources of stress aren't the same throughout the phases of the academic year, and neither are they evenly distributed across that time. For example, among new students, in September there are more cases of reported homesickness and loneliness, in October of alcohol abuse, suicidal thoughts and self-harming, in November of depression and anxiety, and so on. Clearly, these issues negatively impact the student's experience, but also tend to affect his or her fellow students, so that their experience might suffer as well. Researchers have previously investigated the stress of student life and the sources of stress among students, and have come up with a student life stress inventory. However, the hypothesis that there is a pattern in the kinds of issues that students face during the phases of the academic year has not been tested so far. This project aims to collect primary data about the specific common problems that students needing support face at each stage of the academic year, and to find out if there is a clear pattern in this. Should the hypothesis be confirmed, it would mean that there is a dynamic "psychological profile" of the academic year in terms of how the transition to university and the pressures of a student’s life affect the welfare of students as the year progresses. This would allow for specific student support services to be tuned to that profile for greater efficiency and better co-operation between the services. A survey to record the common problems that students needing support face, conducted among all students in university accommodation (mostly first year students). Five monthly surveys in total to be conducted, covering September, October, November, February and March (please note that the first three of these have already been completed). Interviews with randomly selected first year students (some living in private accommodation, some in university accommodation and some at home with parents), conducted by student interns recruited through the university's Career Services Internship Programme. The interviews aim to explore in depth the changes in students’ perceptions of the common issues that affect their welfare at each stage of the academic year, and also give additional insight into possible effects of gender, age and course on these perceptions. Discussions within focus groups consisting of student services practitioners to record their views and the information they have about what are the most common issues their services tackle during the phases of the academic year. It is envisaged that student services managers will firstly discuss the above within their departments / units and then a focus group consisting of representatives of these departments will meet for final discussion. The aim of this will be to map the existing deployment of services and resources against the needs for support of the students. Secondary research methods will also be used. Existing data on students dropping out of university (monthly) will be acquired from the university registry. Data from interviews will be used to better explain the dynamics of the changes in the common concerns that students in need of help have during the phases of the academic year. By comparing the results from the surveys and the interviews with the results from discussion groups with student services practitioners, potential gaps in services or inefficiencies of the deployment of these services will be identified. By comparing data from primary sources with the data on students dropping out of university, most likely causes for dropping out will be identified. A dynamic map of the changes in the students’ concerns during the stages of the academic year. Identified priorities for providing support to students during the stages of the academic year. Suggested steps towards more efficient deployment of particular student services. Potential to roll out the project at other universities and refine the results based on a much larger student population.